You are here: Home / About Farming & Food / Why Do Farmers Keep Turkeys Inside? 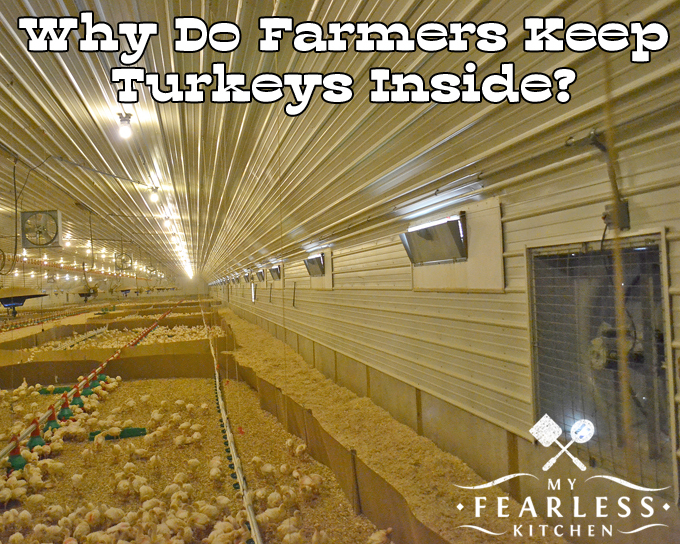 Have you wondered why farmers keep turkeys inside? Turkeys don’t like to be too hot or too cold. That’s just one of the reasons farmers keep turkeys inside. 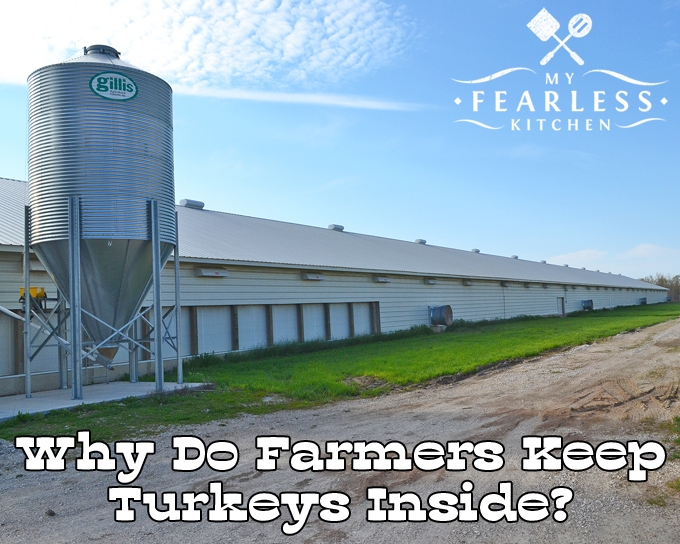 Keep reading to find out about the turkeys’ temperature-controlled barns! Protect them from predators. Turkeys are a prey species. If they are kept outside, the adults are at risk from any predators (cats, dogs, coyotes, and anything else). The baby turkeys (poults) are also at risk from large birds of prey. Protect them from disease. In the last few years, there have been outbreaks of Avian Influenza in the midwest. 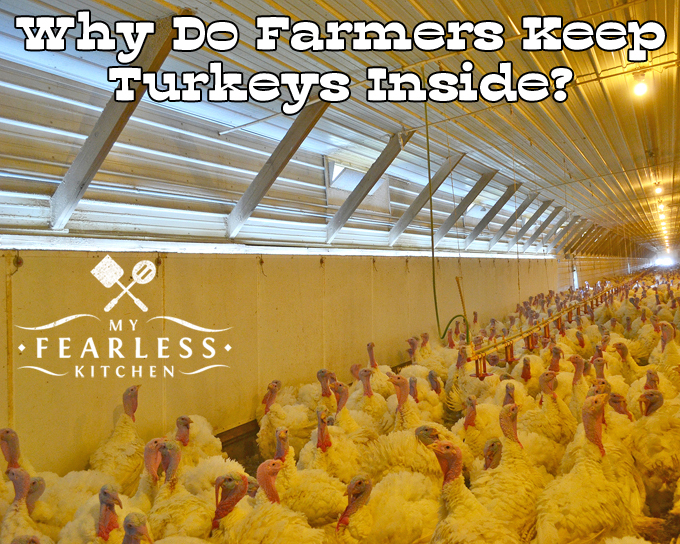 While this deadly disease did affect a few indoor flocks of turkeys, most farms were spared – simply because the turkeys are kept inside, where they have no exposure to other birds. Keep them in a temperature-controlled environment. Turkeys don’t do well when it is too cold or too hot. Keeping them inside means the farmer can control the temperature in their barn. How is the Temperature Controlled Inside Barns? 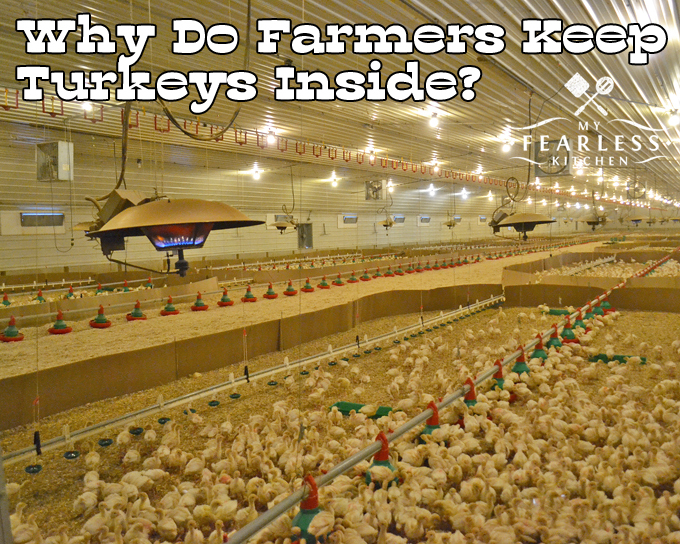 Ventilation is very important in turkey barns. Turkey poults (baby turkeys) need to be kept warm, but they still need good ventilation to keep fresh air coming into the barn. In the brooder houses, the air is kept warm with brooder stoves. There are vents in the walls that open in to let fresh air in. There are also fans in the walls that pull fresh air into the barn. The large fans hanging from the ceiling help to circulate fresh air through the whole barn. The bigger birds are a little different matter. Older (and larger) turkeys don’t like the heat so much, so it is important to keep them cool in the summer months. Katie and Bart’s finisher barns use a system called tunnel ventilation to keep their birds cool in the summer. In a tunnel ventilation system, a portion of the wall on both sides of the front of the barn opens. You can see the ventilation panels in the photo below, just behind the feed storage bin. The panels can be completely closed, open just a little bit (like you see in the photo below), or open all the way to a slant of 45 degrees. These barns also have fans near the ceiling to help circulate air and large ventilation fans at the back of the barn that pull air out of the barn. The combination of the open panels at the front of the barn and the exhaust fans at the back of the barn helps to create a breeze through the barn. When the panels are open all the way and the fans are running full speed, there can be a breeze of up to 10 miles an hour through the big barn! 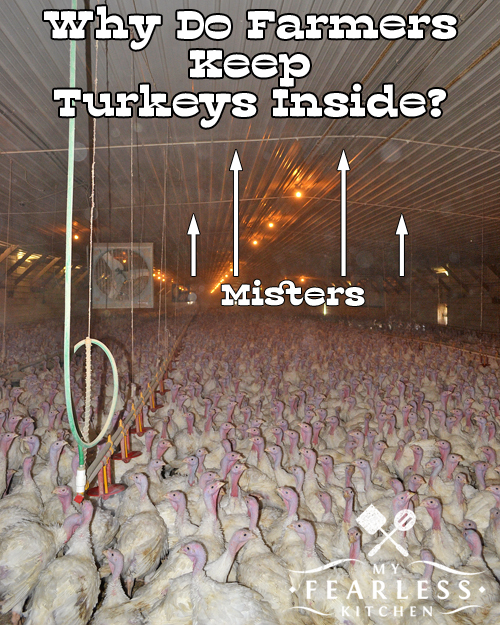 There is also a mister system in the finisher barns that can help cool the birds off even more. This is like putting a fan in a window in your house – when the fan blows out, air is pulled in from other open windows, creating a breeze. We used to have a large fan in our attic that did the same thing. We would turn the attic fan on, open a bunch of windows, and we could keep cool inside without having to turn on the air conditioner! Who Monitors the Temperature in the Barns? Keeping the barns at a steady temperature can be a difficult job. All the ventilation on Katie and Bart’s farm is automatically controlled by computers. It is just like the automatic thermostat in your house. If the temperature inside the brooder house gets too warm, the brooder stoves are turned off, the ventilation panels are opened, and the fans are turned on. If it gets too cool (less than 85 degrees for the poults), the stoves are turned back on, the panels are closed, and the fans are turned off. The tunnel ventilation in the finisher barns is also controlled by computers. Too cold, and the curtains close and the fans turn off. Too warm, and the curtains open, the fans turn on, and the misters turn on. If something ever goes wrong, or if the thermostats aren’t working right, Katie and Bart get alerts on their phones and at their house. They drop everything and head to the barns to fix the problem. There rarely is a problem, but when there is an issue it is usually during drastic weather changes or storms. There’s nothing like getting woken out of your warm bed to go check on a bunch of turkeys in the middle of the night, but that’s part of the job! They also have generators just in case the power goes out. The generators are tested weekly so they are ready in the case of an emergency, and they automatically turn on if the power does go out. The generators for the barns turn on before the generators for the house! 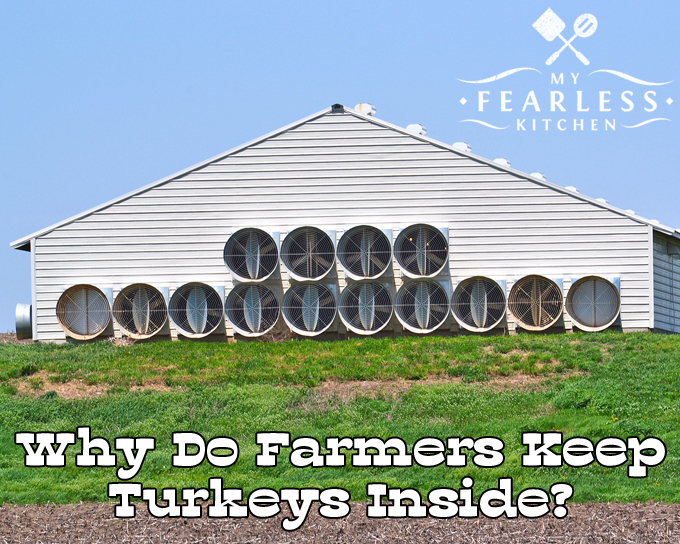 Tunnel ventilation, like Katie and Bart have in their finisher barns, is a relatively new way to keep turkey barns cool. 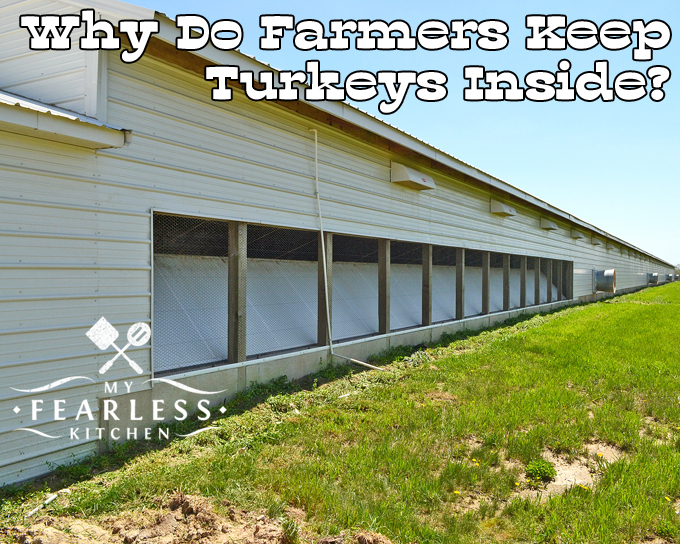 Most turkey barns use curtain ventilation like we saw on Heather’s pig farm and Brian’s dairy farm. The curtains work in a similar way, but the whole side of the barn is an adjustable curtain. Fans on the back of the barn help to pull in fresh air through the open walls. The curtains and the exhaust fans are also automatically controlled, just like the tunnel ventilation system. When I visited Katie and Bart’s farm, the weather made a big jump from 75 degrees one day to 95 degrees the next. That’s a big jump for anyone to get used to, especially a bunch of almost fully grown turkeys. The ventilation system was working overtime that day! In the photo below, you can see the ventilation panels open as far as they will go. Here are the ventilation fans at the back of the barn. You can see that only two of the 14 fans were not running (on the far left and far right). The misters were also working that day. A fine mist of water is sprayed out of the pipes across the ceiling (the white arrows in the photo below) and down onto the turkeys. It’s like getting to play in the sprinklers! We saw a similar system when we looked at dairy cow barns last year. What do you do to keep you and your family cool during the summer? Check out the National Turkey Federation for more information about turkeys and lots of great turkey recipes. Also, check out Katie’s blog, On the Banks of Squaw Creek, to see more about her farm, and how her whole family gets involved in raising their turkeys.